Connecting with the community! Often times we overlook our local supporters, because we are truly focused on the more important circumstance at the time. Aristocrat Motors and Mercedes Benz of Kansas City have taken remarkable steps in generously supporting local organizations, schools, hospitals, foundations and such. With any business making a profit, and being a successful business is their key goals, but it is of equal importance to them that they support the Greater Kansas City community and the efforts to enhance the communities that they call home. They support several organizations such as The Kauffman Center for the Performing Arts, Children’s Mercy, Safehome, KU Medical Center, NAACP, The Folly Theater, The Midland, Kansas City Art Institute, and countless other. This amazing vehicle wrap is just another example of how they focus so much on the community. They choose to make the organizations and community the focal point of this design. Aristocrat has continually put those foundations first. We are so proud to be a small part of this display of giant generosity shown by these two Kansas City dealerships. What is most amazing about this wrap is all of the support, and assistance that is displayed here. Make sure you get out and support those who support us. Creating this circle of support is going to continue to make Kansas City Great. Thanks Aristocrat, and Mercedes Benz of KC! It might be.. It could be..It Is a Homerun!! Wrap It Up hit this design & vehicle wrap out of the park and sports fans wont miss this coming down the road. Play It Again Sports® is your neighborhood sporting goods store offering new & quality used sports and fitness equipment. They buy, sell & trade new and used sports equipment and fitness gear and pass the savings to you! Find brands like Nike®, Adidas®, TaylorMade®, Wilson®, Easton® & more. Visit or give em a call about the sports gear in your garage that’s never used. They pick up & deliver and you wont miss them coming! Freshness! What do you think about this new van wrap for Fresh KC Water? 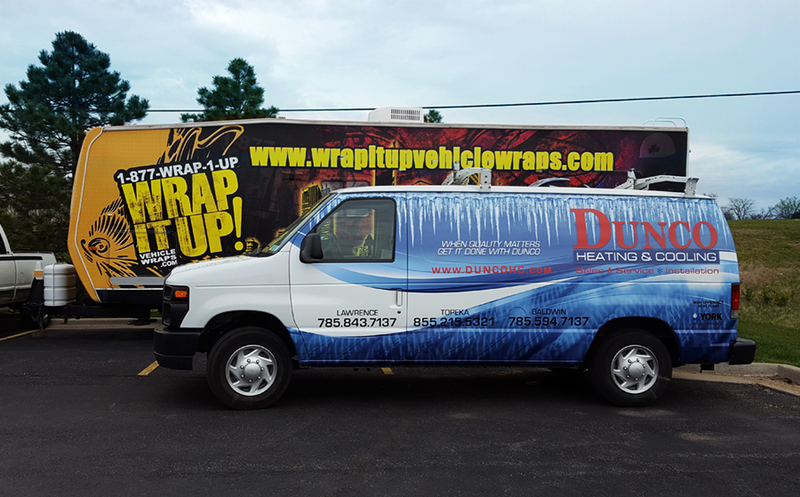 This wrap is a great example of how you can advertise and stay consistent to your brand. Sometimes for what ever reason you may not need a full wrap, however we have a solution for you to make sure you stay consistent and stay advertising. At Fresh KC Water they help you get quality water made with quality products. Thanks Fresh KC Water! We did it again! 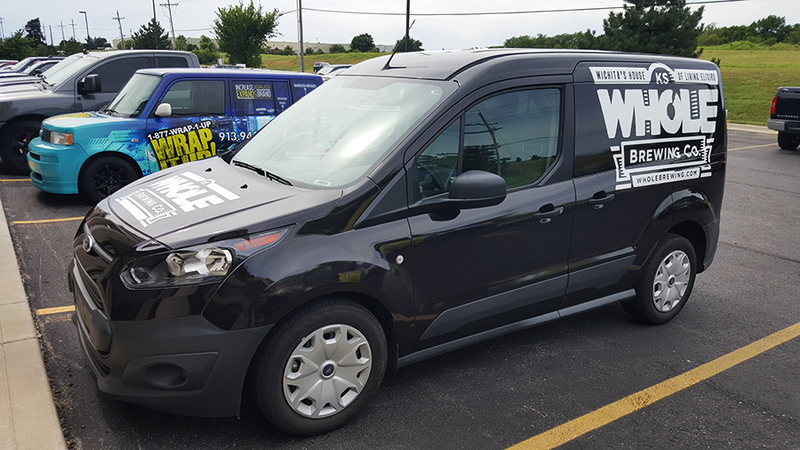 This van wrap for Whole Brewing Company is another wrap done for our good friends at Standard Beverage. The minimalist approach turned out really nice. This design utilized the great contrast of jet black and white, and showcased the amazing logo of Whole Brewing Company. This summer when you are feeling parched make sure you try one of the many creations of Whole Brewing Company. Drink Responsibly! Twins! Check out this amazing Dodge duo for SVB Wood Floors. We have done several vehicles for SVB, and this time we did a pair of Dodges van wraps with a twist to an existing design. If you are in the Kansas City area and you are needing a fresh new look on those wood floors make sure you give our friends at SVB a call. Thanks SVB! They just keep getting better! 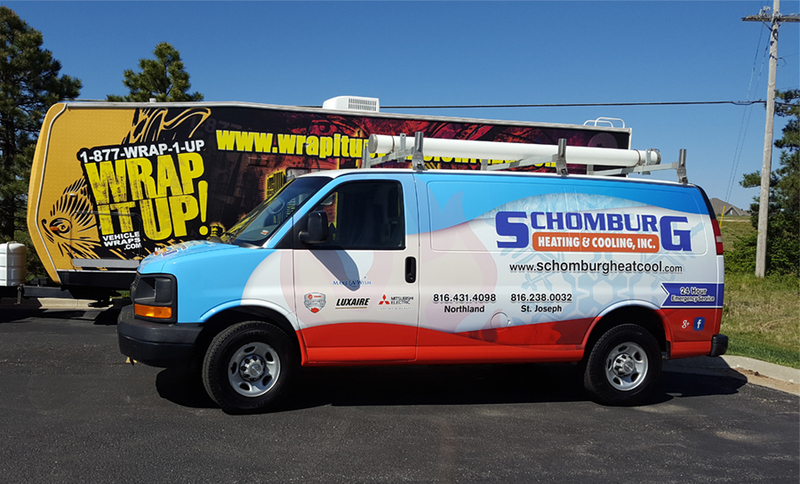 Check out the newest van wrap for Schomburg Heating and cooling. We have wrapped several vehicles for Schomburg and each time they turn out more amazing than the first. This amazing design has adapted brilliantly to each and every vehicle we have wrapped in their fleet. If you are looking for some assistance fighting off the summer heat make sure you give our friends at Schomburg Heating and Cooling a call. Thanks Schomburg! Another one! 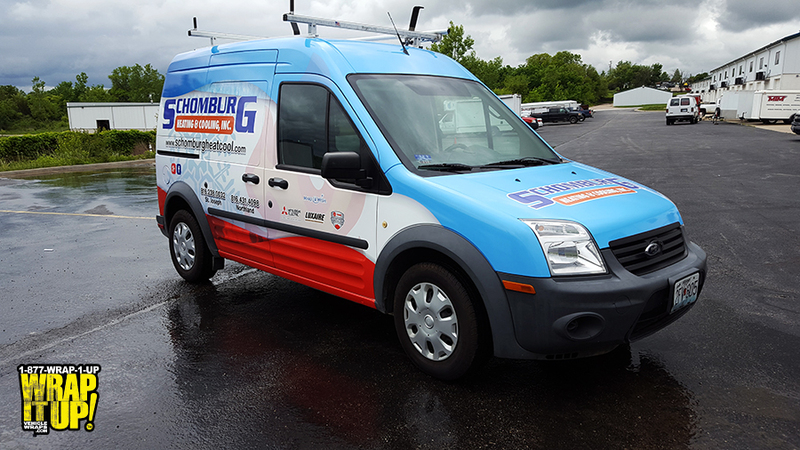 Schomburg Heating and Cooling has added yet another wrapped vehicle to its fleet. This well balanced design fits nicely on all vehicle big or small. If you are in need of heating and cooling assistance make sure you give Schomburg a call. Thanks Schomburg! 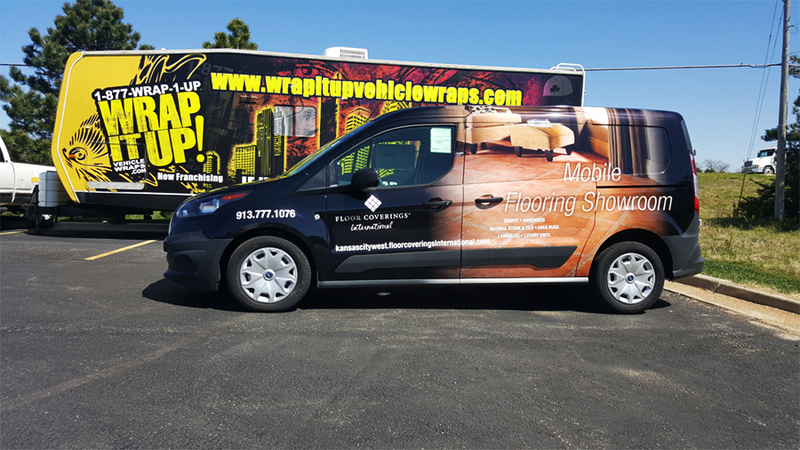 Here at Wrap It Up we have an amazing crew of highly trained vehicle wrap installation experts. Face it most of us cannot even place a stamp on an envelope strait. When it comes to a vehicle there are numerous factors, and obstacles that can come to play when installing a vehicle wrap. Our crew has wrapped thousands of vehicles, and has spent countless hours gaining the expertise and precision it takes to be an installation expert. So if you are in need expert installation make sure you send your projects to Wrap It Up! Twins! Have you seen these vans working around Kansas City? 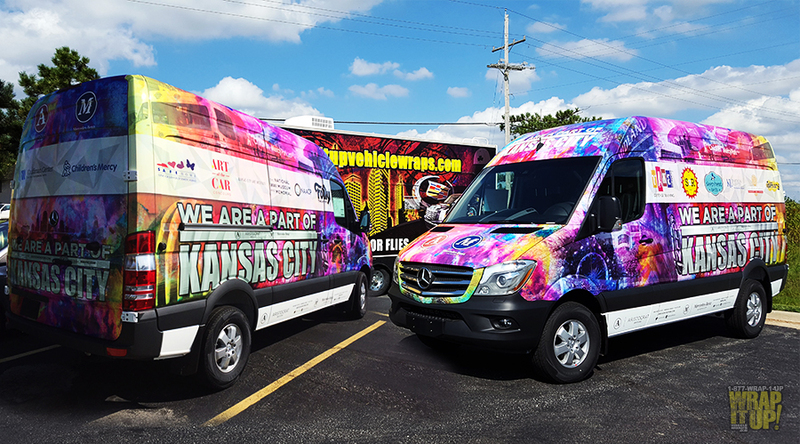 The odds of you seeing them just got greater, because Pride Mechanical just added two new van wraps to their fleet. We have done several wraps for pride. Their design works well in the balance and contrast it has. At Pride they take “Pride” in all aspects of their operation, from the equipment they sell to the development of their craftsman. If you are in need of A/C or refrigeration help make sure you call Pride Mechanical. Thanks Pride!